The weather gods are still indecisive in my neck of woods. One day it’s all bright and sunny with warm breeze and blindingly blue skies and the next day it’s wet and gloomy dampening our spirits! When I am about to pack our winter coats in vacuum bags and take out light cardigans, the heavens open their doors to downpour like never before. It’s supposed to be spring and the summer bank holiday is just a couple of days ahead! Well, its bit exasperating is an understatement! While the weather gods continue to struggle to make up their mind, there is no doubt in my mind about the food that is churned in my kitchen. 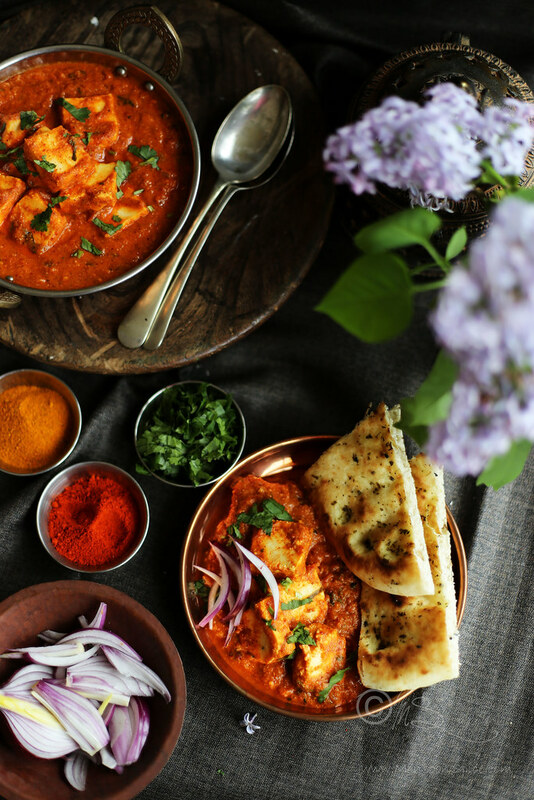 Hot and spicy curries are and will always be the firm favourites in my home during all four seasons, even on scorching summer days! Sounds crazy? Well, I am not taking about the curries that demand all your attention and time. 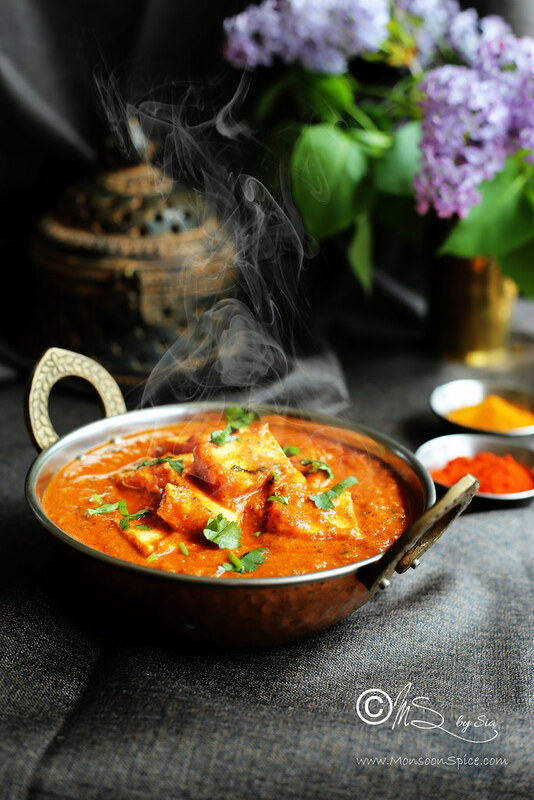 I am talking about the curries that needs couple of minutes of your time and all you need is to breeze in and out of kitchen for stirring the glorious food simmering in a pot on the stove top. 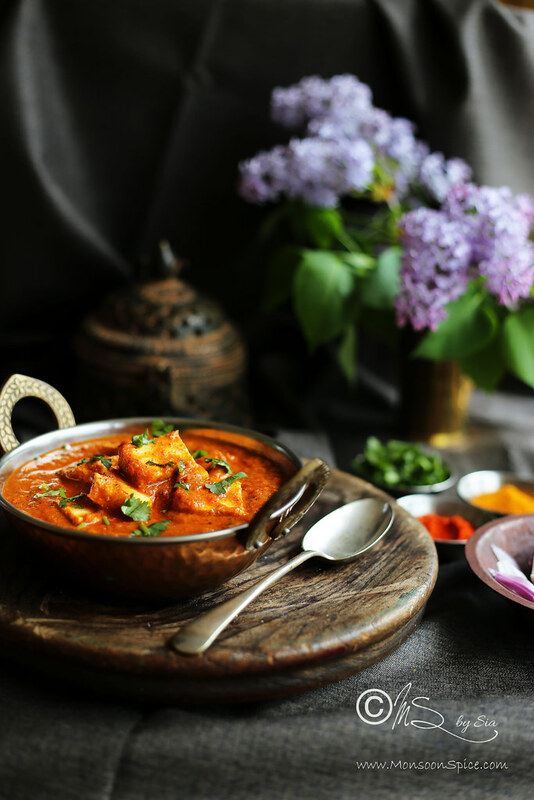 Yes, I am talking about such recipe which is simple and easy to cook and yet ends up looking and tasting like you have spent hours slaving in the kitchen while perfecting it, recipes like Achari Paneer Masala. Unlike the dry version of Achari Baingan, this one is gravy based dish. 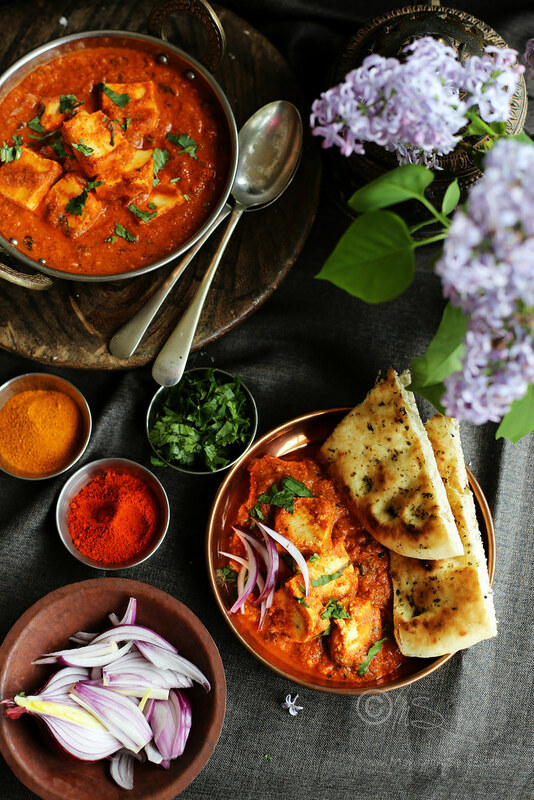 The secret to the best tasting curries is the spice powder used in making them. 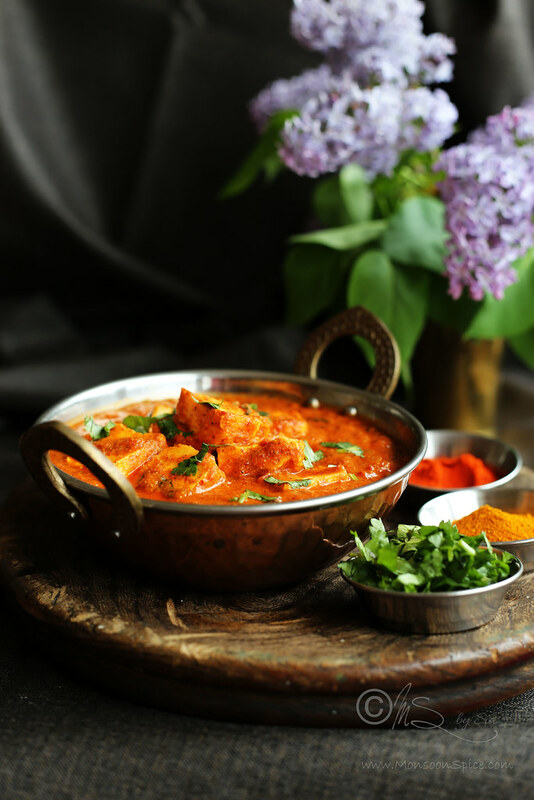 When more than 5 spices are used in making the masala powder, you got to make sure that the right quantity of spices are used so that one spice doesn’t over power the other and they all blend harmoniously giving the curry that special aroma and flavour. Every time I assign myself with a task of preparing spice powders for the curries, I make sure that I rush into carefully choosing, measuring them and roasting them! Always choose the best quality and fresh spices which are packed with aroma and flavour. Next, carefully measure them and make a note of them as when you want to recreate the same taste, you know exactly how much of spice is used in making that fabulous dish. 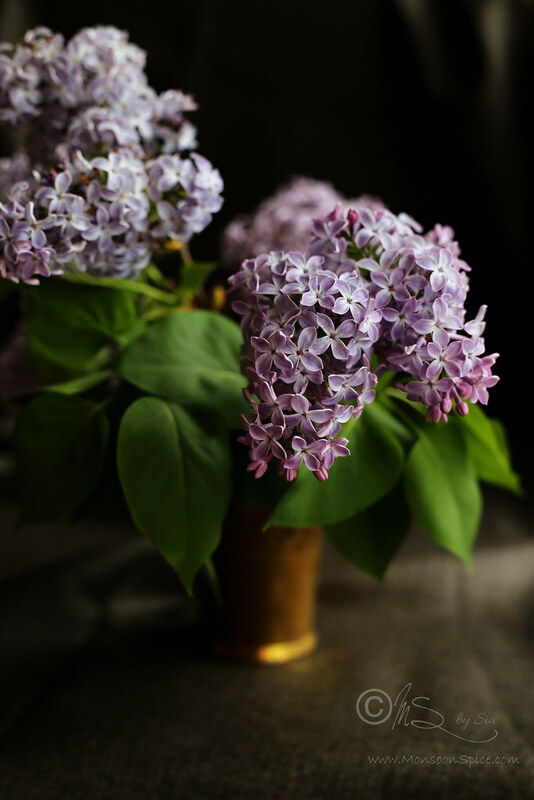 When it comes to roasting the spices, make sure that they are roasted on a lowest flame till their colour deepens and their perfume spread in my kitchen and teases your senses. This roasting spice is very sacred and something that cannot be rushed. 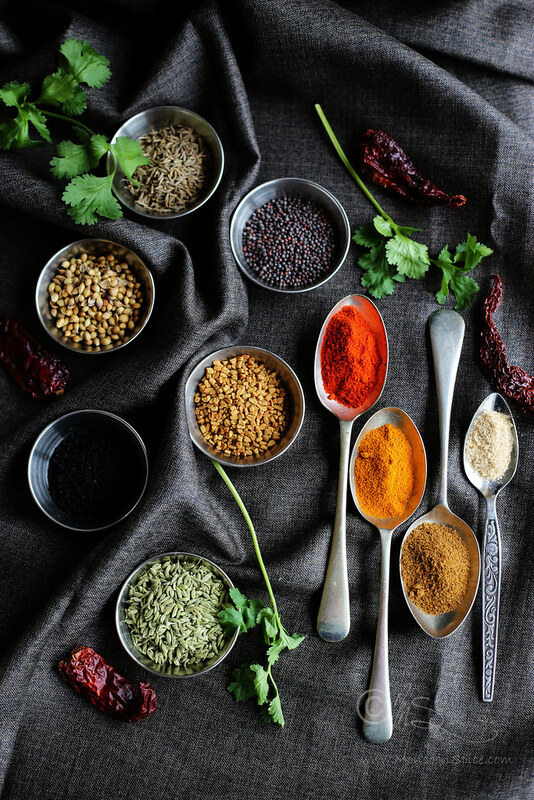 Think of these spices as small kids and like every kid, these spices too need your constant attention. If you get distracted or take your eyes away for a moment, they will burn and turn bitter and ruin the taste. 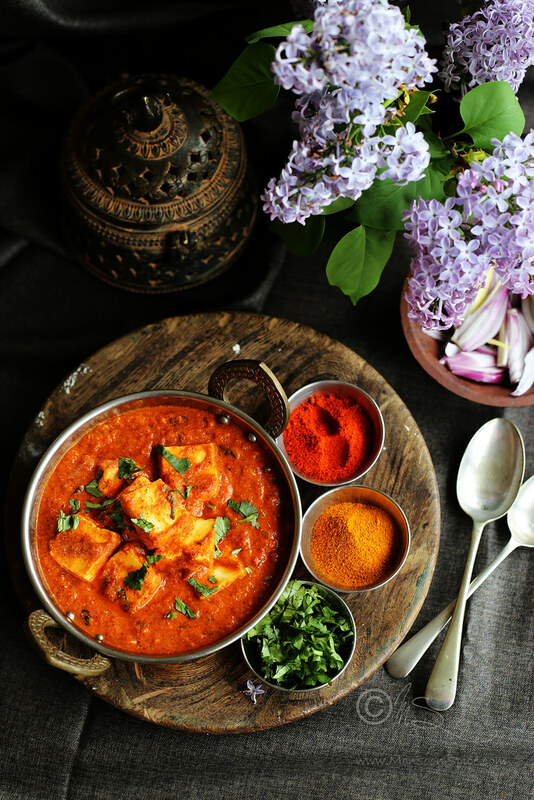 This pickle masala for the Achari Paneer Masala takes 2-3 minutes of your undivided attention. So please do make sure that you do not rush this part of the cooking process. One has to enjoy this therapeutic process, can’t rush to as in a hurry to reach the fish line in a running race. If using fresh tomatoes, make a small + mark on the tomatoes and place them in a pot of boiling water and let them cook for 5 minutes. Drain all the water and peel their skin. Keep them aside until needed. If you are short of time, you can skip coking the tomatoes and simply use the fresh, uncooked tomatoes in the recipe. Dry roast methi, mustard seeds, cumin seeds, fennel seeds, nigella seeds, coriander seeds, and dry red chillies on a low flame for about 2-3 minutes until the spices are roasted to golden brown. Please take care not to burn the spices as it will make the curry taste bitter. Transfer the roasted spices to bowl or plate and let it cool down to room temperature. Once the spices have cooled down, grind them to powder in a spice grinder or mixer grinder. To this add tomatoes (canned or freshly prepared) and roughly chopped bell peppers and grind them to smooth paste. Keep it aside until needed. Heat oil in a pan and add cumin seeds and hing. Once cumin seeds sizzle and change colour to deep golden, add finely chopped onions, sugar and a pinch of salt. The salt will speed up the cooking process and the sugar will help in caramelising the onions. Sauté the onions until they turn golden brown, about 2-3 minutes on medium flame. Add ginger-garlic paste and fry them on medium flame until the raw smell disappears, about 2 minutes. Next add prepared spicy tomato paste and give it a good stir. Be careful while stirring as the hot gravy will start to bubble and splatter. Once the gravy begins to bubble, add half of finely chopped coriander leaves and ½ cup of water. Mix in salt to taste. Cover and let it cook for 10 minutes for all the flavours to blend well. Make sure you stir the curry in between. Add whisked yogurt or fresh cream and reduce the heat to low. Let he curry simmer for another 5 minutes. 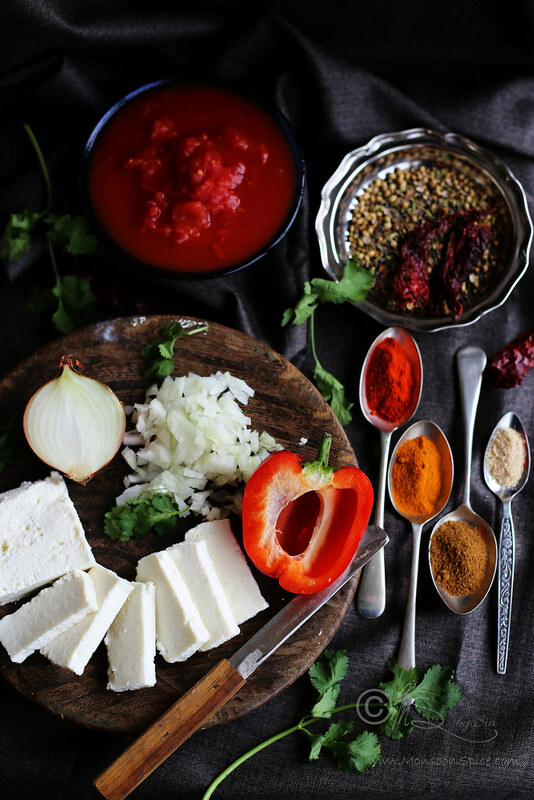 Mix in paneer pieces, garam masala and adjust the seasonings. If you find the gravy too thick, add ½-¾ cup water and mix well. Cover and let the curry simmer for 5-10 minutes. Turn off the flame and mix in remaining finely chopped coriander leaves. Let the curry rest for at least 10 minutes for all the flavours to blend well. 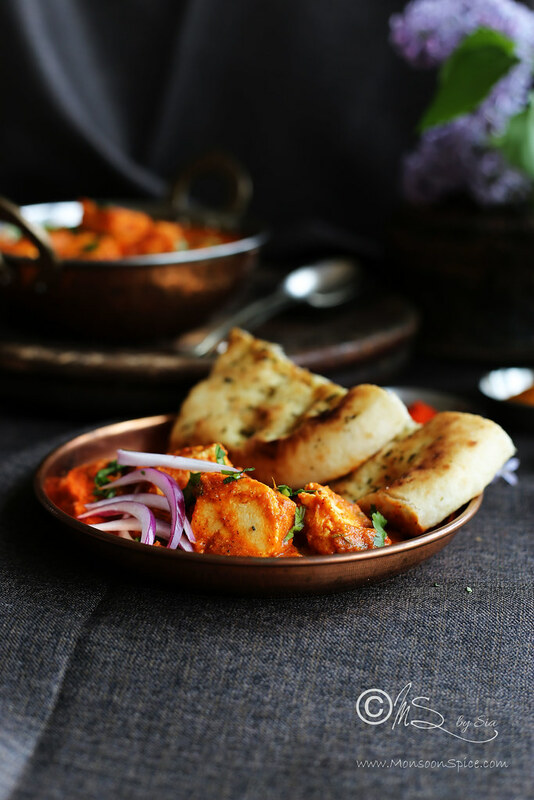 Serve this delicious Achari Paneer Masala with Indian flat breads like roti, naan or chapatti or with any flavoured basmati rice and enjoy! Please take care not to burn the spices as it will make the curry taste bitter. Addition of half a capsicum or bell pepper in the gravy paste enhances the taste of the curry by adding light peppery taste to it which is what I like in Achari dishes. You can skip using it if you are not too fond of them or don’t have them in your fridge. I usually add pinch of salt and sugar when sautéing onions. The salt will speed up the cooking process and the sugar will help in caramelising the onions. Add little more sugar if the tomatoes are too sour. You can use fresh cream in place of yogurt for richer gravy. If using yogurt, make sure that it is not sour and use fresh sweet yogurt. The curry looks delicious Sia and thanks for reminding on the process of slow roasting the spices, somewhere along the way of our daily cooking routine these simple yet important steps gets neglected. Love your simple and quick recipe series they are very helpful especially as summer has started. 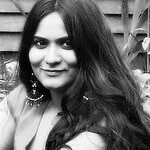 Thank you, Shilpa! When I began my cooking journey, I was someone who was always in a great rush to run to the finish line and missing out the fun of cooking :) But my view has changed over the years and I find cooking really therapeutic and relaxing. Thank you for sharing Sia, Amma's are the best !! A beautiful and mouthwatering dish! So many wonderful spices. I'm sorry if this is a weird/stupid not to mention convoluted question, but this recipe looks fantastic and I'd really like to get it right when I make it so I have to ask: When you say 400 gms tinned/canned tomato do you mean one 400 gm can of whole tomatoes with the juice or 400 gms of whole tomatoes weighed without the juice or perhaps a 400 gm can of diced tomatoes or maybe something else I didn't even think of? You are most welcome. Please do let me know how it goes. 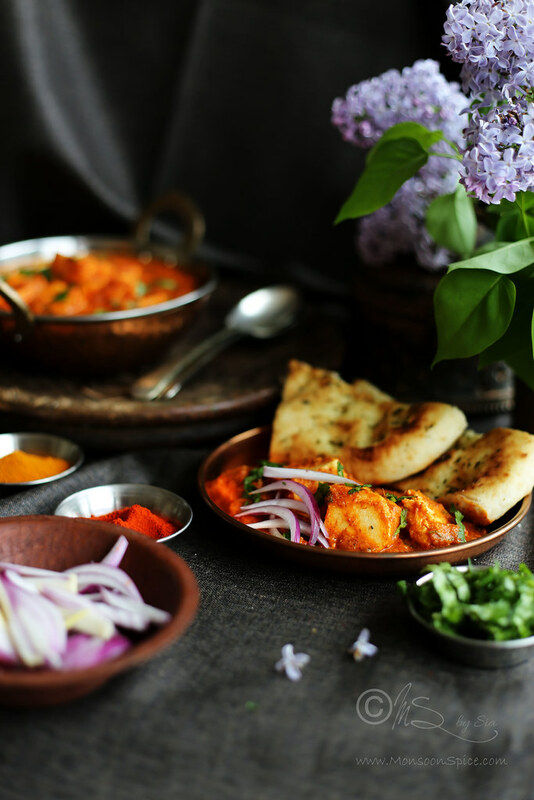 I finally had the opportunity to try out this recipe yesterday for a family get-together, and, served with ghee rice, it was a great success! Everyone took seconds and I got several demands to cook it again before the meal was even over. Thank you so much for sharing this delicious recipe! I'll definitely try out other recipes from you blog as well. That's fantastic! Way to go Annik. Thanks for taking time to leave a feedback.